Our financial planning philosophy revolves around six key elements. Structure: We can help you gain control of your financial life with a range of customized services and online tools that will organize everything from budgeting, taxes and insurance needs to planning, investments and goal setting. Progress: Helping you identify and prioritize your goals is step one for us. Periodic reviews and consistent encouragement, to help you stay on course and achieve your goals, is step two through infinity. Proactivity: Life happens. While no one can predict with 100 percent certainty what lies ahead, we can help you create a flexible financial plan that can enable you to proactively manage life’s hills and valleys. Insight: Knowledge is a two-way street. We’ll strive first to understand your background, philosophy, needs, objectives and concerns to develop a personal plan for your unique situation. Then we’ll provide you with the necessary resources to help you understand your options and make confident decisions. Collaboration: We’re in this together. Because we strive to develop a long-term relationship based on mutual respect, your success becomes our success. We’re committed to working collaboratively with you and on your behalf. Financial planning can sometimes seem intimidating, but it doesn’t have to be. We follow a straight-forward, 6-step process with our clients, as outlined by the CFP Board. Those steps are detailed below. Your financial planner will explain his or her financial planning services and define each of your responsibilities. Along with compensation, you’ll discuss how long the professional relationship will last and how to make decisions. You and your financial planner will talk about your current financial situation and gather any necessary documents. Together, you’ll define your personal and financial goals, including timeframes. You also discuss your comfort level when it comes to taking financial risks. Your financial planner will consider all aspects of your situation to determine what you need to do to meet your goals. Depending on what services you’ve asked for, your planner may analyze your assets, liabilities and cash flow, current insurance coverage, investments or tax strategies. Your planner will go over his or her recommendations with you, explaining the rationale so you can make informed decisions. At this stage, your planner will also listen to any concerns you may have and revise recommendations if necessary. Together, we’ll agree on how the recommendations will be carried out. Your planner may carry out the recommendations or serve as your guide, coordinating the process with you and other members of your advisory team (such as attorneys, accountants and other professionals). As you work toward your goals, your financial planner will help you keep an eye on your progress stay on track. This includes checking in with you from time to time, reviewing your situation and potentially recommending adjustments to the plan if necessary. Modern Portfolio Theory was first documented in 1952 by Harry Markowitz, who later won a Nobel Prize in Economics for his work. The theory helps quantify risk and has become widely accepted by Institutional Investment Managers during the past 50 years. Diversification is more than simply dispersing one’s “eggs” into many baskets. Modern Portfolio Theory explains the benefits of portfolio diversification and demonstrates quantitatively why and how it works to reduce risk. Markowitz was also the first to establish the concept of an efficient portfolio. An efficient portfolio is one that has the smallest attainable portfolio risk for a given level of expected return (or the largest expected return for a given level of risk). A sound investment strategy includes a well-diversified portfolio of stocks and other securities. A common pitfall among investors is the urge to commit a disproportionate percentage of funds to an individual stock (IBM, for example, because you inherited the shares from your grandfather) or to try to cash in on certain stocks or industries that may seem hot at the moment (such as defense industry stocks during wartime). Rather than becoming married to individual stocks, investors should commit to an investment strategy that helps them to pick and choose investments and get out when appropriate. Diversification means more than simply dispersing one’s “eggs” into many baskets. The goal is to balance risk and return within your portfolio of investments. The best way to reach that balance is through strategic asset allocation based on modern portfolio theory. Modern portfolio theory explains the benefits of portfolio diversification and demonstrates quantitatively why and how it works to reduce risk. First documented in 1952 by Harry Markowitz, who later won a Nobel Prize in Economics for his work, the theory has become widely accepted by institutional investment managers during the past 50 years. Markowitz was also the first to establish the concept of an efficient portfolio. Simply put, if efficient is defined as more output for less input, then an efficient portfolio can be defined as more return for less risk. So what does all this mean, exactly? Keeping in mind that it’s called modern portfolio theoryand not modern portfolio absolute fact, there are ways you can apply this concept to your investment plan. Begin by infusing as much “fact” into your plan as possible. How old are you? When do you want to retire? What lifestyle do you currently enjoy (measured by monthly expenditures)? From these facts, you can derive additional facts – such as your retirement lifestyle goal, the amount of capital required and consequently your required rate of return. Next, begin applying theory. Markowitz suggests rate of return can be predicted based on the type (or asset class) of an investment. The risk of an investment can become an objective measure by calculating the standard deviation of its past returns. The standard deviation is a statistical calculation that will tell us the likely range of possible returns compared to the average return. In simple terms, you might have an investment that averages 10 percent return with a standard deviation of 8 percent. In this example, most returns will range between 2 percent and 18 percent in any given year. By analyzing expected returns and corresponding risk for each asset class, we can begin to determine if the required return for your plan is achievable. We can also determine the likelihood of meeting that return. Further, by combining multiple asset classes into your portfolio, we can further reduce your risk, while maintaining expected return. Thus, the portfolio becomes more efficient. The planning process becomes subjective at this point, as we work to assess whether you can tolerate the level of risk (standard deviation, uncertainty) required to meet the expected return. Do not minimize the importance of assessing your risk tolerance. Risk assessment is the most important, and most difficult, step. Since sticking to your plan is the biggest determinant of success, it’s critical that you choose a plan that you will keep. Taking on too much risk results in anxiety, stress, sleepless nights and ultimately abandonment (and subsequently, failure) of the plan. Again, bring as many facts into the equation as possible. How did you react to past market losses? Did you sell out, feel anxiety, experience regret? How readily can you replace your portfolio, or where are you in your wealth building cycle – creation, accumulation, preservation, depletion? And how important is your objective? Are you willing to take additional investment risk that may result in the delay of retirement five years if you don’t achieve the expected return? After assessing risk, you must then determine if the expected return in the investments that you are considering with your corresponding risk will meet your needs. If not, it’s back to the beginning, to re-evaluate your financial needs and goals. Once you’ve established the best plan for your needs, stick with it – but don’t neglect it. A recent Harris Polls Interactive survey found that approximately 12 percent of investors have never reviewed their investment portfolio, and about 22 percent have not reviewed their portfolio for two or more years. Your portfolio can get out of shape over time, due to the outperformance or underperformance of various asset classes and industry sectors. Your personal circumstances also can change over time, which impacts your overall financial plan. Thus, periodic reviews of your plan and rebalancing of your investment portfolio are essential to assure your long-term financial success. As part of the firm’s strategic investment process, the Perspective Investment Committee meets quarterly to review and fine-tune the list of funds our advisors utilize to build balanced client portfolios. In an open discussion format, the team reviews the merits of various funds in each investment category. Funds are selected based on several criteria and must pass a series of “cuts” to make the list. Considerations include factors such as cost and the fund manager’s tenure, as well as overall performance and risk vs. return (both of which we compare to peer funds and other benchmarks). The process begins each quarter with Perspective’s Portfolio Administrator who conducts preliminary research and narrows the field of funds for consideration to about 30 in each category (from a universe of several thousand choices). Perspective uses two advanced industry software programs to analyze hundreds of funds. We also tap into the Schwab Institutional website, to which individual clients do not have access, and obtain additional fund data. Finally, the firm utilizes Fi360, a leading resource for investment fiduciaries that provides research, analytics and reporting. Funds already on the list are reviewed for any changes, such as new management, increases or decreases in returns, or changes in expenses or risk. Funds that no longer meet our strict criteria are removed from the list. 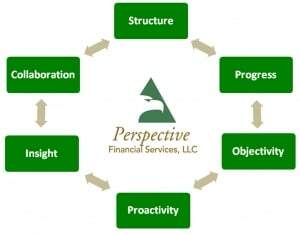 Likewise, new funds are discussed and, when appropriate, added to Perspective’s list of approved investments.